V3 Power is a workers cooperative with members based in Edinburgh,Glasgow, Nottingham and Sheffield. We have been building small windturbines and other renewable energy systems since 2006. We provide Hand Built Wind Turbine Workshops across the country where we teach groups of between 8-12 people how to build and install a Hugh Piggott wind turbine from scratch using basic materials. Participants get hands on experience and learn transferable skills in welding, wood carving and working with magnets and resin. In 2011-12 we ran courses with Edinburgh Engineers Without Borders and with 8-12year olds at four remote Highland schools. On this trip V3 also met, the legend that is, Hugh Piggott at his home in Scoraig. Since 2011, V3 have built three wind turbines for people with offgrid small holdings in rural Scotland. We have also serviced and are providing ongoing maintenance to a number of small commercial turbines in Scotland. Between 2012-13 V3 helped Edinburgh Science Festival develop and deliver experiences around concepts of energy, power and renewables. One of our members, Aran Eales, works at Strathclyde University and, in 2014, ran a course with students there. 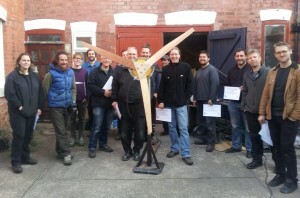 In 2015 Robin Duval has joined us from a background in wind energy engagement, helping to establish community energy cooperatives and is looking forward to supporting more groups to take their power into their own hands with DIY renewable energy! We generally try to organise the final installation of the turbines we build on courses to either happen as part of the course itself or shortly afterwards. Occasionally however we end up building turbines without a suitable installation site so we are always on the lookout for windy spots to adopt them! coming on a course or hosting your own course and we can send you details of our space requirements.